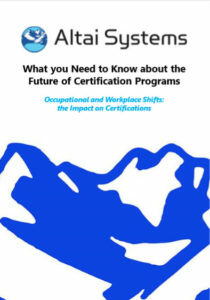 Altai’s comprehensive eBook, What you Need to Know about the Future of Certification Programs is here! If you are interested in receiving your FREE copy, please complete the form below, and you will receive the link. Ready to start your trek to the top? Contact our exploration team to help you discover ways Altai Systems can take your association to new heights.